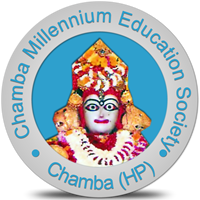 With the Aim of instilling meaningful education and enhancing self-confidence among the students, Chamba Millennium Education Society made its humble beginning in the year 2007, by starting Chamba Millennium B.Ed College. This is Co-Educational Institution and is affiliated to H.P.U. Shimla. Society was registered on 17/3/2007 vide Regd. No. 1/2007 under Act. No. 25 of 2006. The B.Ed College is recognized by H.P.U. Shimla vide letter No. 1-385/2007-HPU(Acad) Dated 19/9/2007 and approved by NCTE Jaipur & Chamba Millennium ITI is affiliated by SCVT Sundarnagar & Approved by NCVT & DGE&T Delhi. Vill. Labkana P.O:- Saru Teh. & Dist. :-Chamba (H.P) 176310.